Bella Knitting: I-Cord Bind-Off: With Bonus I-Cord! 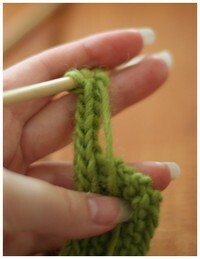 I-Cord Bind-Off: With Bonus I-Cord! Lots of photos here, folks! I used the i-cord bind off on the socks I knit for Ingrid (I luuurve those socks) and it got me thinking about how much I enjoy the look of the i-cord bind off. If you haven't done it before, I hereby present you with a little tutorial on how to do so. 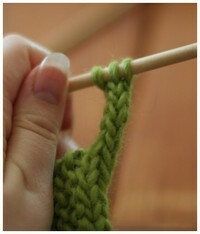 The super-cool thing is, if you know how to do the i-cord bind-off, you also know how to do applied i-cord. It's the exact same procedure, except obviously to do an applied i-cord you need to pick up some stitches, but you apply the i-cord by doing the i-cord bind-off. Pretty nifty, huh? Also, if there's anyone out there who doesn't know plain-Jane i-cord, I have instructions for that too if you scroll down. Click on any image for a larger view. Step 2: If you want a tidy corner edge, cast on a couple of extra stitches -- if you skip this step, the bind-off will lend a slight curve to the corner of your knitting, which is fine, if that's what you want. As Elizabeth Zimmermann would say, it's "knitter's choice." Step 1: You've got those three stitches, right? Well, it doesn't actually have to be three stitches, but if you're going to make an i-cord, it should be a small enough number of stitches that you can pull the yarn tightly across the back to get it to curl into a tube. (Of course if you want a bigger tube, you could always close up the back by using a crochet hook on those ladders of yarn -- Nona has a great tutorial on how to do so.) When knitting i-cord, use either two DPNs or a circular needle so that you can just slide your stitches over instead of dealing with the whole slipping-back-to-the-left-hand-needle business. Smart idea to do a tutorial on applied icord-- one of those processes that needs to be seen in action rather than described in text. Plenty of readers will be glad of it. Btw, that monkey suit is the greatest. Measure looks terrific as Curious George. This is an excellent tutorial. Thanks.